BEAVERTON, Ore. — Westview High School sophomore Colby Clay collapsed and nearly died on May 23. His lacrosse team was out on the field practicing for the upcoming playoffs when Colby took a hit to the chest. "And it hit me sort of underneath the pads. Then it just stopped my heart and I took two steps and collapsed," he said. At first, his teammates thought he was joking around, but quickly realized this was much more serious. "We flipped him over and I saw his eyes in the back of his head and he was kind of gasping for air. And I ran over and grabbed my phone and called 911,” said teammate Ben Balzer. “You hit yourself at the right spot at the very right time, so it'll disrupt that electrical wave so the heart never resets for the next beat. So basically your heart dies," Wu explained. He jumped in, doing compression-only CPR, while Ben Balzer got on the phone to 911, and a coach ran to get an athletic trainer from the next field over. "During compression only CPR, he regained consciousness several times, but I did not stop because I knew that his heart was not pumping," Wu said. Athletic trainer Tina Garcia was able to find an AED and bring it to Colby’s side. He was shocked three times and attended to by EMS who transported him to Legacy Emanuel after his heartbeat and breathing returned. He was placed in a medically-induced coma for the evening, but recovered enough to be taken off support and soon woke up. He has no recollection of what happened. "I just woke up, and my mom was there and she told me what happened. And I was pretty shocked," he said. Now he’s still on a heart monitor and only light activity. Doctors want to make sure his heart is OK before he’ll be cleared to play lacrosse again. 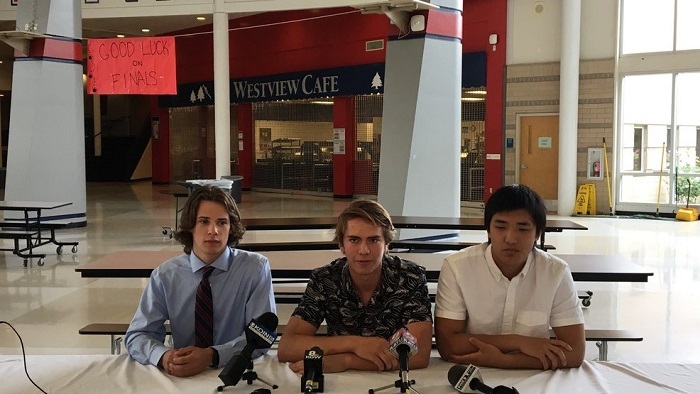 Wu and Balzer just graduated from Westview, so they won’t be back next year. Colby said he'll be forever grateful for what they did for him.